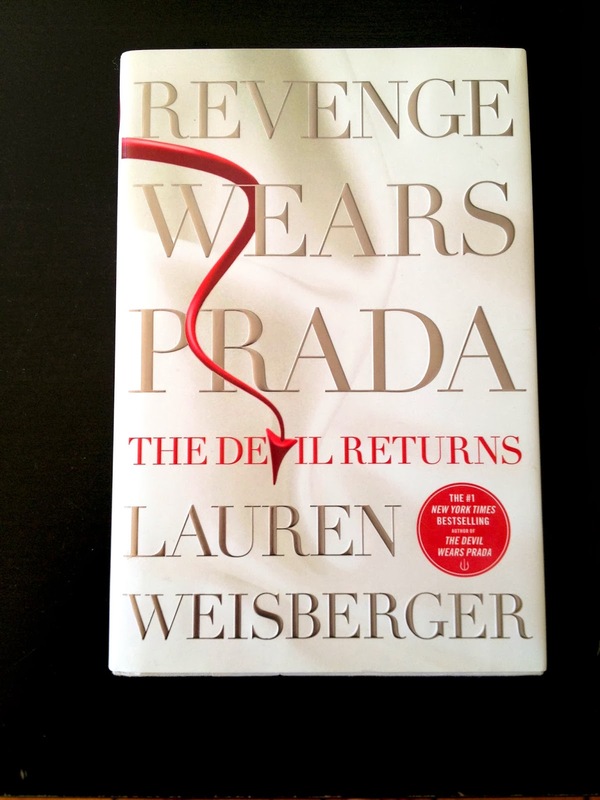 Perhaps I'm just really out of the loop when it comes to current fiction, but I had no idea that Lauren Weisberger was even writing a follow-up novel to her 2003 best-selling The Devil Wears Prada. My cousin turned me on to the sequel when I asked her for light, fun summer reading recommendations, and this book was at the top of the list. Revenge Wears Prada: The Devil Returns picks up ten years after the end of the first novel and follows Andy Sachs as she navigates the rough waters of managing her own high-end wedding magazine, marriage, and the reappearance of Miranda Priestley in her life. I'll be honest here and confess that it's been about six years since I read The Devil Wears Prada, and unlike my husband, I struggle to remember the minute detail of every book that I read. In fact, I have the superhuman ability to forget whole plot lines, characters, and major revelations. It's a rare gift. All of this is to say, I don't remember the first book all that well. I remember that I liked it, and considerably more than the movie. I liked that the characters were more interesting and developed. I liked that Andy was more flawed and relatable and Miranda more cold-hearted and inhuman. I liked that there were real consequences for Andy, such as losing her boyfriend, and that the book didn't offer the unbelievable optimistic ending that the movie did. The obsession with fashion, weight, and high-profile celebrities wasn't too appealing, but I appreciated that the book allowed me to peer into a world that is far from my own. The Devil Wears Prada is pretty much the definition of "for fun" reading, and I didn't begrudge it its place in the literary world. I wasn't sure what to expect when I picked up Revenge Wears Prada: The Devil Returns, but it felt like all of the discoveries and resolutions that Andy made in the first book were completely for naught. By the end of The Devil Wears Prada, Andy moves out of Manhattan and back in with her parents, and after her year with Miranda Priestley, she is committed to staying out of the high-end fashion magazine industry, focusing instead on fiction writing. But despite all of this, Andy ends up launching a high-end wedding magazine called The Plunge with none other than her sworn enemy from her Runway days Emily Charlton. In the tens years since we last saw Andy, she has made a place for herself among New York City's most elite, indulging in (forced) weekends at the Hamptons, spa days, and yacht parties. Her free-spirited childhood friend and roommate Lily has long since escaped to Colorado and become a rock climbing, yoga fanatic, and her relationship with Alex has been over since before he relocated to Mississippi. Perhaps its out of sheer loneliness that Andy decides to make a best friend and eventual business partner out of Emily, but it's difficult to believe that Andy could put up with someone as superficial, bossy, and downright mean as Emily for ten years solid. Emily's constant digs about Andy's weight and fashion sense are insensitive and grating, and I really have to question Andy's perception that she's so different from Emily and everyone else like her. The perfectly chiseled Manhattan media mogul husband certainly doesn't help, nor does the Monique Lhuillier wedding dress, daily used Equinox membership, or catered family affairs. Andy's life is such a far cry from anything approaching "normal" that she's hardly recognizable from the first book, and I was left wondering how this determined, intelligent, and wisened young women ended up surrounded by superficial elitists who don't care about anything of substance. And really, the easiest answer is that she has become just like everyone else. The plot of the book is pretty easy to sum up: Woman runs magazine. Woman gets married. Woman experiences marital troubles and has a baby along the way. Miranda Priestley (i.e. The Devil) makes continued offers to buy woman's magazine. All hell breaks lose. Woman gets out. Again. It's essentially the same schtick as the first book, only with a lot less Miranda and a much dumber Andy. Apparently Andy's learned to hold her tongue in the past ten years, and I kept thinking that so many of her problems would be solved if she simply communicated her thoughts and feelings with those around her. More importantly, though, there is so little of Miranda in the book that Revenge Wears Prada: The Devil Returns seems misleading as a title. While she may be terrible, Miranda is endlessly fascinating, and I think that most readers would have liked to see a lot more of her and her machinations in the sequel. But she's barely in the book, and even though Andy directly interacts with her in a few scenes, for the most part, Miranda feels like some faraway and distant threat, more of a nightmarish hallucination rather than a real person. The lack of Miranda is certainly a disappointment, but I think it also reveals an unpleasant truth about Weisberger's writing, namely, that Andy is largely uninteresting on her own. While Andy narrates both of the books, it is Miranda who readers are most interested in and want to see. Andy may provide the framework, but she is merely the lens through which we see Miranda, the true stand-out of these stories. In addition to my issues with the characters and plot of Revenge Wears Prada: The Devil Returns, I found the details of the book to be, on the whole, uninteresting. A significant portion of the book is comprised of flashbacks to fill in the ten years that readers missed. While these are helpful to ground readers and give them context, I thought that they were excessive. There are whole chapters dedicated to flushing out details from the past, and I found myself wondering why Weisberger didn't write a book that covered a longer period of time and encompassed all of these stories. We get them anyway - why not just give them to readers in realtime? The book also focuses extensively on high-end fashion and style, and there are pages that go on and on about extravagant clothing, furniture, decorations, accessories, shoes, and food. I realize that these details are part of the appeal of Weisberger's novels, but perhaps my tolerance for such over-the-top and superficial details has gotten lower over the years. I thought that these long descriptions were overdone and extremely off-putting, especially if I was to recognize Andy as a savvy and intelligent woman who isn't consumed by such materials things. I ended up skimming most of these descriptions, knowing full well that if I wanted to get a dose of high-fashion, I could simply pick up a Vogue magazine. Finally, I really disliked that Revenge Wears Prada: The Devil Returns gives readers the sensational and unrealistic ending that it avoided in the first book. At the end of the sequel, Andy is back in almost exactly the same place she was at the end of The Devil Wears Prada. She has given up her professional achievements to get away from Miranda, and she is left trying to pick up the pieces and start over again. But instead of focusing on the struggle ahead and the consequences of Andy's choices (the loss of her husband, best friend, and magazine), Weisberger sends Andy straight back into the arms of her old flame Alex. It's so cliche and annoying that I couldn't help but laugh. To put Andy back with the old boyfriend she'd lost ten years earlier is not only ridiculous, but also incredibly unbelievable. I was willing to tolerate Andy's occasional "what if?" thoughts about Alex, but to actually bring them back together after ten years of practically no contact was too much, and I disliked that Weisberger ended with the unrealistic happily ever after. Overall, I found Revenge Wears Prada: The Devil Returns to be a silly, superfluous, frustrating, and ofttimes annoying read. If you enjoy high-end fashion and style, the details may be enough to warrant picking it up at your local bookstore. But the plot, characters, and heart of the story fall flat, and I recommend passing on it. I heard much of the same in other reviews, and am determined to skip it.